It was a privilege to be able to listen to Lewis, one of the strikers at Crayford McDonalds, explaining about their dispute at a meeting hosted by Greenwich UNITE and the National Shop Stewards Network in South-East London this evening. Lewis explained how the arrival of a new store manager at the Crayford branch had been the last straw for a workforce who, like most fast food workers, were already fed up with the low pay and working conditions that they were supposed to put up with. This bullying manger picked on vulnerable workers yet, despite numerous grievances taken out by staff, the company did nothing to address them. It's a tale that too many workers - including teachers - will recognise but the difference at Crayford McDonalds (and similarly at the Cambridge branch) is that the workers have stood up to the bullying and joined a union that is prepared to back them in action, the Bakers Food and Allied Workers' Union (BFAWU). 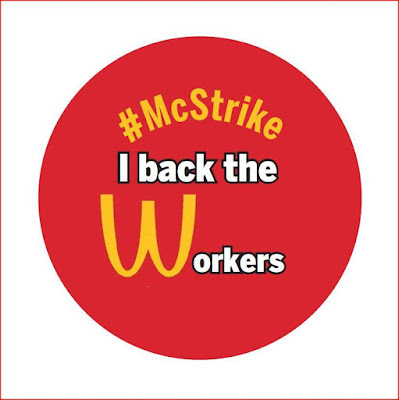 As Lewis explained, the workers at Crayford voted 96% for strike action and, together with their Cambridge colleagues, hit the headlines with their McStrike action on Monday. McDonalds tried to dismiss the action as being taken by an insignificant 0.01% of their workforce. However, they had better start worrying, because if these two workplace strikes can produce the amount of media coverage that Monday's action received, just think what further damage to their reputation will be done by further, and wider, strikes! As the meeting discussed, Monday's strike is indeed just the beginning. As a UNITE member in the meeting tonight put it, "now it's going to be that manager who is the most frightened person in the building, because you've shown the power of a union when people stand up together"
As I said myself in congratulating Lewis and his colleagues, the strike hasn't just encouraged other young fast food workers, it's also inspired older trade unionists too. As teachers have said to me, 'if McDonalds workers can stand up for themselves, we should be too'. As one sign of that growing mood for action, one of the McDonalds strikers will be speaking at the pay rally being called by unions across the London Region on October 12. Trade unionists can donate to help McDonalds strikers and, above all, encourage other young workers they know to get involved themselves. Just as with other disputes, we can also co-ordinate our campaigns together - and it was great to know that Lewis already knew about the strike action being taken in nearby Charlton Park Academy in a dispute over cuts to sickness entitlements which continues this term. If you live locally, come and help support the campaign in Woolwich on Saturday September 16th. As it says on the Facebook event page, "we will be collecting funds for the strike and also talking to workers and the public on the high street about why we should all be in a trade union". I'll leave the last word to Lewis: "McDonalds sets the benchmark for other companies setting poverty wages - if we can shift them, we can also help thousands more workers too". Let's make sure we help them, alongside the BFAWU and the Fast Food Rights campaign, to do exactly that!